Note: I (Yin Wah Kreher) had fun writing this post with Wendy Taleo, who hosted the Virtually Connecting session. A ping from Wendy Taleo drew me out of my teaching-grading cave to the Higher Education Research and Development Society of Australasia (HERDSA) conference this Wednesday, July 6, also a Hari Raya Puasa public holiday in Singapore. 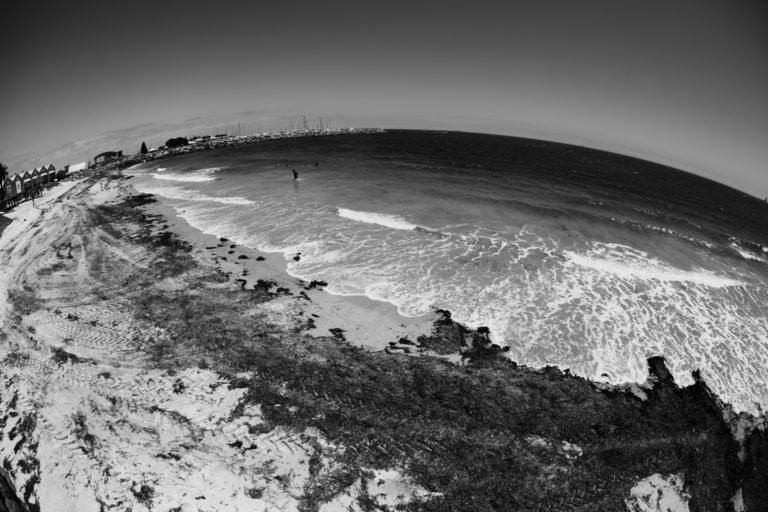 Though Fremantle, Perth (Western Australia) might be closer to me than say, an American conference, work commitments still hold me and many others back from going wherever and whenever we wish. Many thanks goes to Virtually Connecting (VC) for bringing diverse peoples, cultures, fields and disciplines together to stimulate our own learning. 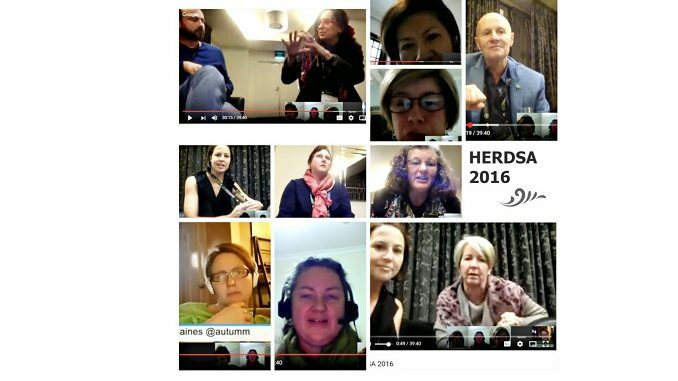 The theme of HERDSA 2016 is The Shape of Higher Education, “an opportunity to not only report and reflect upon and to critique and challenge the current shape and direction of higher education but also to look to the future and engage your colleagues in creative possibilities.” Joining us at the informal Google Hangout chat this evening were onsite buddies, (Rose Nash and Karen Miller) and the two keynote speakers, Alastair Summerlee, currently the Executive Director of FundtheFood with the Kirchner Group in the United States, and Sally Clark, Deputy Head of The University of Notre Dame Australia, Broome Campus and Assistant Dean, Nursing and Midwifery. Other onsite guests were Sarah-Jane Gregory, Abigail Lewis and Chad Gladovic. We were joined online by Autumm Caines, Tess Newton-Cain and myself, with Wendy Taleo playing the hosting role. Wendy invited the participants to share some highlights of the conference. Below are a few that both of us have included for discussion in this post. Begin with small. Alastair Summerlee shared some highlights from his keynote speech. He spoke of how he retooled the first year program in his university. Traditionally, baccalaureate programs start off with large enrollments and are trimmed down to smaller classes as the cohort progresses through the years. Alastair spoke about how he flipped it around by grouping the first year program students in small numbers to teach students to first learn how to learn. Thus prepared, students were more ready to take part actively in learning even when placed in classes with large enrollments. Co-constructing rubrics with students. Rose Nash, our onsite VC buddy at the conference, shared a presentation highlight about empowering students to co-construct rubrics with the teacher. This was familiar territory to me as I thought about trying this out with my online summer course last year (an 8-week course) but the opportunity to lead and work by themselves (students) was not well-received. First, collaborating on a shared online document presented major obstacles for my students. With most of them being new to online learning and the course being a summer elective crash course, empowering my students — who were holding fulltime summer jobs — to lead and share ideas among themselves became an overwhelming task. My students all had expectations that I would be the expert who would lead them. Connected learning, with its student empowerment themes, was new to them who were raised on the traditional pedagogical diet. If I had a full semester course though, I would try this out again. The remoteness of remote learning. Alistair mentioned that Sally Clark’s keynote made him realise the issues around education in remote parts of Australia. Another guest also mentioned that Sally’s talk had made her think about remoteness and cultural issues about study spaces. Tess Cain discussed remote learning in the University of South Pacific’s (USP) distance education program. Courses are largely text-based due to the diverse and/or low technical proficiency of students and the lack of resources in certain geographic locations in Australia. Students are thus not able to engage in remote learning using a wide range of modalities in USP courses. Even if the instructor attempts to design “engaging materials,” students might not be able to “engage” in them. Feedback. Chad Gladovic asked how ‘valuable’ is our feedback to students. Are they engaging with the feedback that is given? Wendy mentioned that it was great to see some new people to the Virtually Connecting team. Karen Miller was new to this type of connecting and expressed her pleasure in being involved in a tweet after the session. We had a relaxed, informative and engaging chat for about 40 minutes after which our onsite participants had to leave for dinner. I was appreciative of the opportunity to learn from these participants and buddies, in no small way due to this VC arrangement. Wendy also appreciated the opportunity to connect via this Google Hangout format as it can enrich future conversations with these people. Indeed, forty minutes of wise nuggets to be mulled over.